A kid’s book about the Australian environment, cell phones, and a young girl’s fight to stop the greedy developers ruining the landscape. 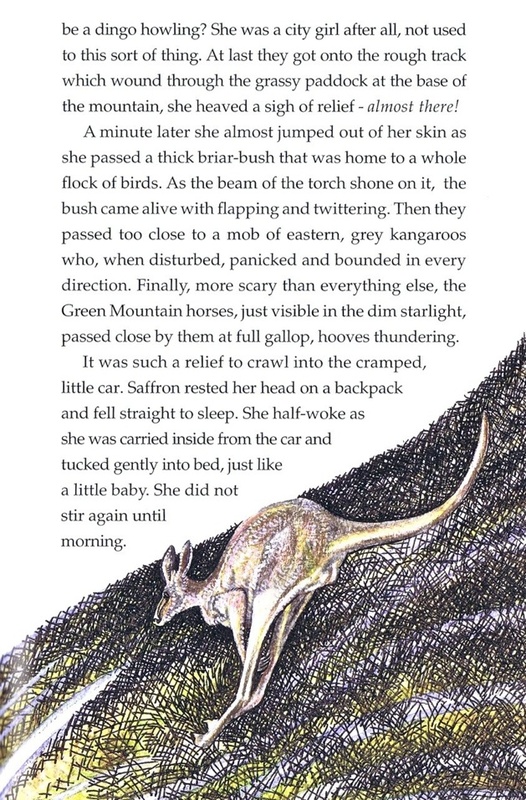 Illustration of kangaroo jumping - Australian landscape be a dingo howling? She was a city girl after all, not used to this sort of thing. At last they got onto the rough track which wound through the grassy paddock at the base of the mountain, she heaved a sigh of relief - almost there! A minute later she almost jumped out of her skin as she passed a thick briar-bush that was home to a whole flock of birds. As the beam of the torch shone on it, the bush came alive with flapping and twittering. Then they passed too close to a mob of eastern grey kangaroos who, when disturbed, panicked and bounded in every direction. Finally, more scary than everything else, the Green Mountain horses, just visible in the dim starlight passed close by them at full gallop, hooves thundering. It was such a relief to crawl into the cramped little car. Saffron rested her head on a backpack and fell straight to sleep. She half-woke as she was carried inside from the car and tucked gently into bed, just like a little baby. She did not stir again until morning. Drawing or image of a kangaroo jumping. Saffron is trying to save Green Mountain from the unscrupulous and greedy developers. A couple of scientists help her cause by studying and filming the flora and fauna of the wilderness area. Pen & ink Australian landscape art.